I love anything that has anything to do with chocolate or hazelnuts or both together. So you can imagine that Nutella is something to which I have a pretty strong attraction. I used to have it when I was a child, by itself, in a little plastic tub…much like those single-serve butter tubs. My mom used to get it for me as a special “treat” when she would shop at a nearby food store. It even came with its own little plastic spoon. It was long after this that I discovered alternate uses for my little childhood snack…spread on bread or cake, eaten with ice cream, on fruits, to dip whole walnuts in, even on plain donuts. 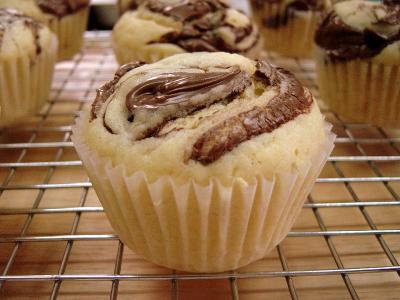 So you can imagine the happy surprise I had when I found a recipe for Self Frosting Cupcakes using Nutella at Nic’s excellent blog bakingsheet. I had to try it out and the results were just as I expected (and Nic described): a rich and tender cupcake that is the perfect host for the wonderful taste of the Nutella. They are wonderfully simple to make, and, as if that wasn’t enough, they even look cute and adorable. My testers were my brother (as usual) and my dad, who loved them as much as I did. There will definitely be a repeat performace. As Nic mentions, and I agree, these are perfect for picnics and potlucks as there is no messy frosting on top…it’s baked right in! So this will be at the top of my list for my next potluck party…and I think I have one coming up…can’t wait to whip these babies out. I was never a fan of nutella but these look too good not to try and make. When in doubt, I can always serve them to my friends and family if nutella still doesn't win me over.